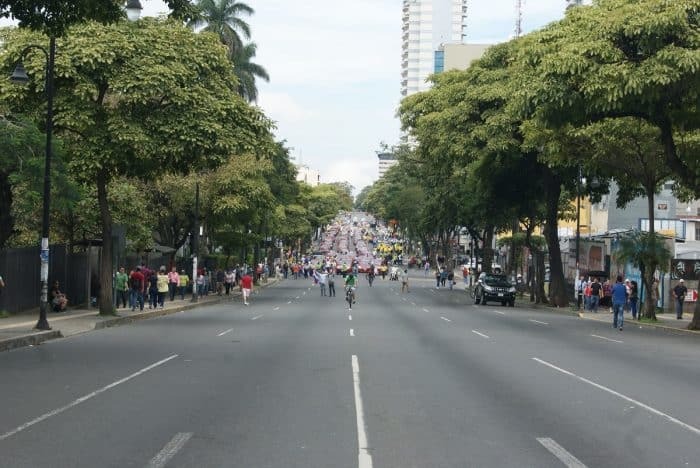 San José — The demonstrations began with a red wave of taxis blocking Avenida 2 in downtown San José. The protests continued throughout the capital city Monday as they did on streets throughout the country: thousands of people voicing their disapproval of a tax-reform law they believe unfairly targets the working class. 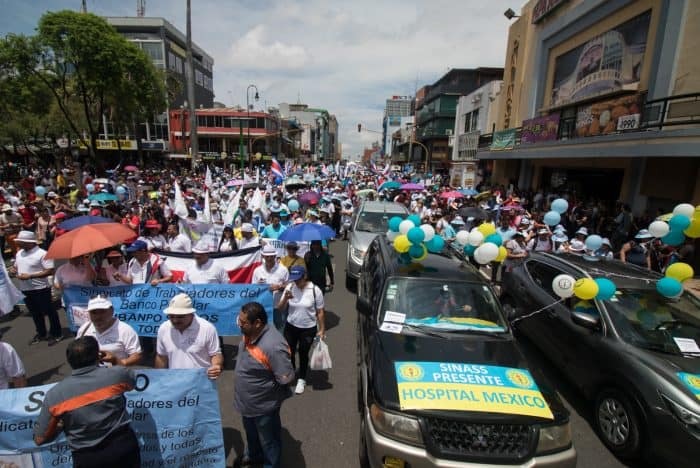 Chanting “El pueblo unido jamás será vencido” — a united people will never be defeated — the crowd marched peacefully from La Merced Park toward the Casa Presidencial in Zapote. But as of Monday afternoon, the Costa Rican government had not yielded ground. President Carlos Alvarado tweeted the government hopes to declare the strike illegal, adding in a statement he “will not enter a dialogue” while the strike impacts workers and students. A este momento 15 entidades han presentando la declaratoria de ilegalidad de la huelga ante las instancias correspondientes. Tomamos las medidas para asegurar que se mantenga el orden público y que se minimice la afectación a las personas. “We are taking measures to ensure order is maintained and to minimize impact on the public,” Alvarado said. Union members representing education, health, transport, and other sectors took to the streets Monday for what they say will be an indefinite protest that will not conclude until the government passes a tax-reform bill that better respects the working class. 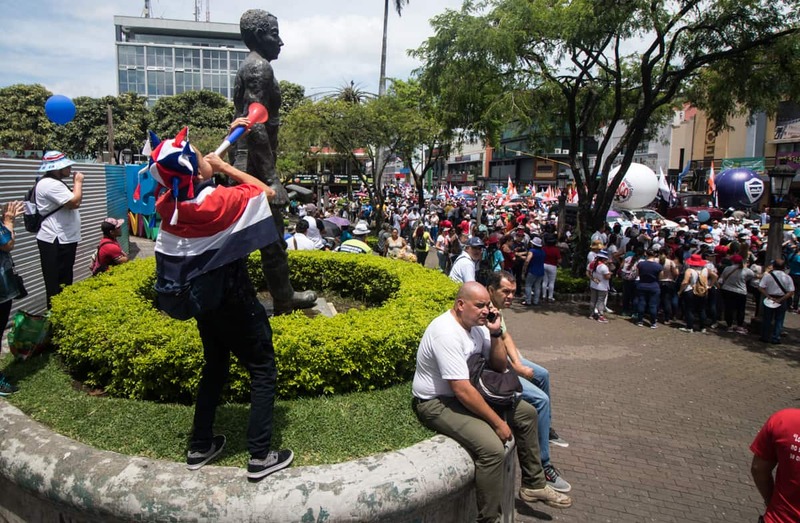 Among the demonstrators was Cynthia Leandro Peralta, a teacher at the Escuela República de Haití who says she has worked within the Ministry of Education for more than 20 years. She marched holding a large banner as the crowd moved west. Alongside her were the children of several of her coworkers. 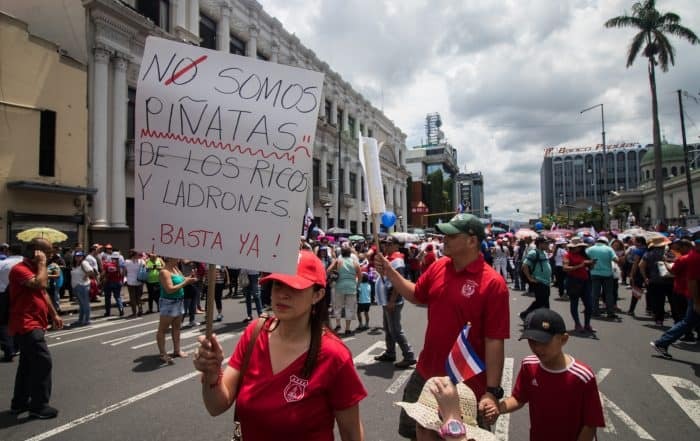 “We show our children and students that we should not only celebrate our history, but to fight for our rights,” Leandro Peralta said in an interview with The Tico Times. While demonstrations impeded traffic on some city roads, elsewhere taxi and Uber drivers commented that the absence of people made Monday feel like a national holiday. Elizabeth Briceño, president of INCOFER, Costa Rica’s national rail authority, tweeted they were able to transport all passengers after an early-morning disruption when protesters boarded a car. Meanwhile, hospitals across the country reduced non-essential care but kept emergency rooms open. Rutas de: Alajuela, Heredia, San José y Cartago operaron esta mañana con éxito. Logramos transportar a todos nuestros usuarios sin afectación. According to the Ministry of Education, more than 8,200 educators went on strike Monday. Monica Chacon, a mathematics teacher, was one of them. She feared rising taxes coupled with stagnant salaries would punish the middle class while allowing corporations and the rich to profit through loopholes. Protesters reached the Legislative Assembly in the early afternoon, but dark clouds hanging over the city finally burst and heavy rains dispersed protesters at about 1 p.m. This is a developing story. Stay tuned to The Tico Times throughout the week for more coverage and updates.